Bite into this creamy Layered Orange-Pineapple Mold Dessert and enjoy making a beautiful dessert with only five ingredients. Learn how to make this orange-pineapple mold dessert and impress all of your guests! Drain pineapple, reserving juice. Add enough cold water to reserved juice to measure 1-1/2 cups. Stir boiling water into dry gelatin mix in large bowl at least 2 min. until completely dissolved. Stir in juice mixture. Remove 1 cup of the gelatin mixture; set aside at room temperature. Stir half of the crushed pineapple into remaining gelatin. Pour into 6-cup mold. Refrigerate 2 hours or until set but not firm (gelatin should stick to finger when touched and should mound). Gradually add the reserved gelatin mixture to cream cheese in medium bowl, beating with wire whisk until well blended. Stir in the remaining crushed pineapple. Pour over gelatin layer in mold. Prepare as directed, substituting 1 cup BREAKSTONE'S or KNUDSEN Sour Cream for the cream cheese and adding only enough cold water to reserved pineapple juice to measure 1 cup. Prepare as directed, using 2 pkg. 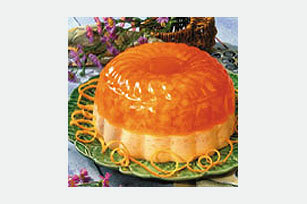 (4-serving size each) JELL-O Orange Flavor Gelatin.